Eric Wallack is a college teacher of humanities, art history, music and literature in Ohio, who also flexes his creative musical muscles in the free-improv world. 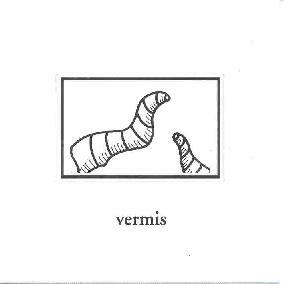 He is influenced by guitarists like Leo Kottke, John Fahey and Robbie Basho, but also free jazz musicians like Albert Ayler, Cecil Taylor, Ornette Coleman and Sun Ra, and these varied, but ultimately related, interests are reflected across the 12 tracks on Vermis. The music is all performed by Wallack, though he often overdubs to accompany himself in duo and what sounds like trio arrangements. The songs reveal a theme... "Tapeworm", "Dung Beetle", "Aphid", "Katydid"... you get the idea. "Tapeworm" opens the set and has a modern free-improv sound, and while it displays hints of the abstract it's enjoyably musical. A nice balance. "Dung Beetle" features modern jazz stylings with a combination of bass and bowed strings that I enjoyed. "Leaf Cutter" showcases various plucking, bowed and scratching techniques. There's hints of Blues and stringed playing that sounds like old Mothers Of Invention violin, all coming together for a pleasing blend of styles. On "Cricket" we hear not only the crickets themselves, but an intriguing blend of John Fahey and Oriental styles. And Wallack really displays his Kottke/Fahey influences on "Centepede" and Cicada" "Wooly-Bear" is similar, but with a cool blend of ambience and avant-Blues and traditional acoustic guitar stylings. "Firefly" is an ambient avant-folky acoustic guitar tune with freaky space efx. And speaking of freaky... Wallack rocks out in experimental strangeland on the trippy "Grub". Excellent creative playing and one of my favorites. Finally, "Earthworm" and "Katydid" are the slowest and most measured songs on the CD, but each musical statement and phrase has a carefully thought out feel to it. "Earthworm" is atmospheric, jazzy, Bluesy, and with just the right dash of dissonance. I really liked these tunes and they were good choices as closing tracks for the set. In summary, the strength of Wallack's music is in his ability to blend various styles to produce avant-garde music that is highly accessible and aesthetically pleasing while still being creative and adventurous. Wallack isn't afraid to mix traditional styles like Blues in with the more abstract elements and the combination is a harmonious one. Ok Eric, hook up with Larry so we can get you down to Columbus for a performance! Vermis is available for purchase from http://www.homemademusic.com/artists/ericwallack, where you can also listen to samples of the music. You can email Eric at: ewallack@owens.edu.